This heavy-duty three-sided locking snap fastener is designed to withstand extreme pressure on three sides without unlocking. 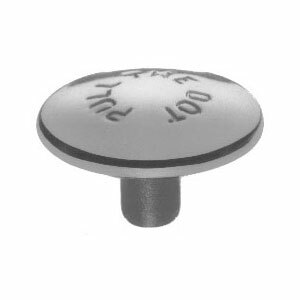 When pulled on the fourth side, where the Pull-The DOT® trademark appears, the fastener releases instantly. With a coined eyelet construction, Pull-the-DOT is self-piercing on standard application materials. Pull-the-DOT has a well-earned reputation for performance in difficult environments and conforms to US Government MIL-10884 specifications, MS27983 Style 4.